Plus Size Picks - Pinup Girl Clothing - Sugar, Darling? Ladies, this is a very special post. 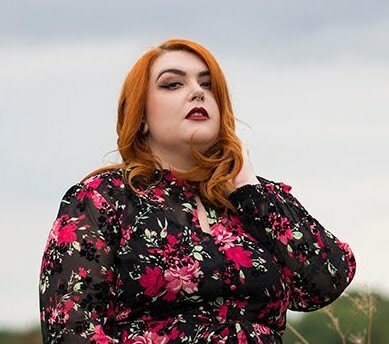 I hereby introduce you to the company that has made some of the sexiest dresses I have ever owned, proving that you can indeed be a show stopping stunner if you're plus size. Pinup Girl Clothing are one of the best vintage inspired clothing companies in the world, ran by a team of glamazon women who really know their stuff including the amazing Laura Byrnes and the drop dead gorgeous Micheline Pitt. They are not a solely plus sized clothing company, but offer most of their most famous designs up to what is the equivalent of a UK 26. I have two dresses from them, one being the Jessica featured below in fuschia pink that I wore for my friend's wedding a few years ago and is still going strong. Everything is so well made with such attention to detail in the shaping and choice of fabrics. I promise you won't be disappointed if you decide to make a purchase! If you're looking for something special that will grab you all the attention and show your curves off to the max I cannot recommend PUG enough, and with a flat international shipping rate of $28 (about £17.50) you could save yourself some pennies by getting some friends in to do a bulk order knowing that postage won't cost the earth.